The poll for the Edublog Awards 2009 closed today. While waiting for the outcome of the voting, I tried to use the PLEM ranking algorithm to rank the nominated blogs in the category "Best individual blog" based on the Wisdom of Crowds and different interaction metrics (PLEM saves and ratings, Delicious saves, Friendfeed comments and likes, Yahoo inbound links, Digg votes, Google Trackbacks, and Technorati blog reactions). To see the result, you can visit the PLEM project Website here, hit the "edublog" tag from the "Popular Tags" list, and choose "Most Popular" as the ranking option. Below is a screenshot of the result. 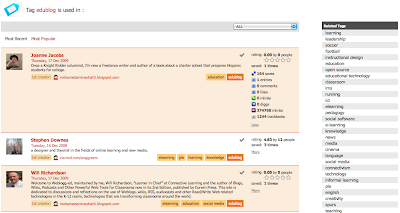 Let's see whether the Edublog Awards voting result will be different or not.